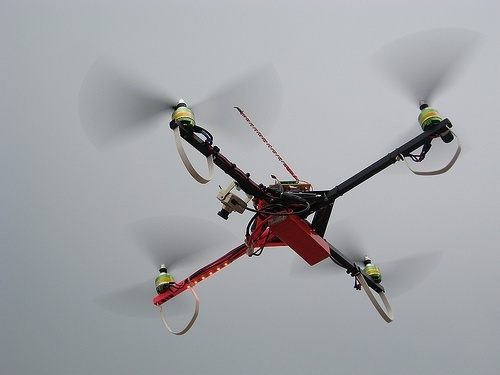 The most effective way to build autonomous aerial vehicle is quad rotor. A quadrotor, also called a quadrotor helicopter or quadrocopter, is a multicopter that is lifted and propelled by four rotors. University of Pennsylvania professor Vijay Kumar and his team developed such a quad rotor robot which can operate autonomously without the help of remote control or GPS System. I found this project very interesting and thought to share it with you. Why this aerial robot different from its counterparts? It it different because of its small size(8 inch) and less power consumption(around 15 watts).Moreover, it is agile,autonomous and smart enough to take its own decisions while flying both indoors and outdoors. It can be used in Biochemical leaks, Construction and Transportation. As professor Vijay explained, it has four rotors. If you spin these rotors at the same speed, the robot hovers. If you increase the speed of each of these rotors, then the robot flies up, it accelerates up. To accelerate this robot horizontally it should be in tilted position. One is to rotate rotor four faster and rotor two slower. And when you do that, there’s moment that causes this robot to roll. And the other way around, if you increase the speed of rotor three and decrease the speed of rotor one, then the robot pitches forward. And then finally, if you spin opposite pairs of rotors faster than the other pair, then the robot yaws about the vertical axis. So an on-board processor essentially looks at what motions need to be executed and combines these motions and figures out what commands to send to the motors 600 times a second. That’s basically how this thing operates. So one of the advantages of this design is, when you scale things down, the robot naturally becomes agile.